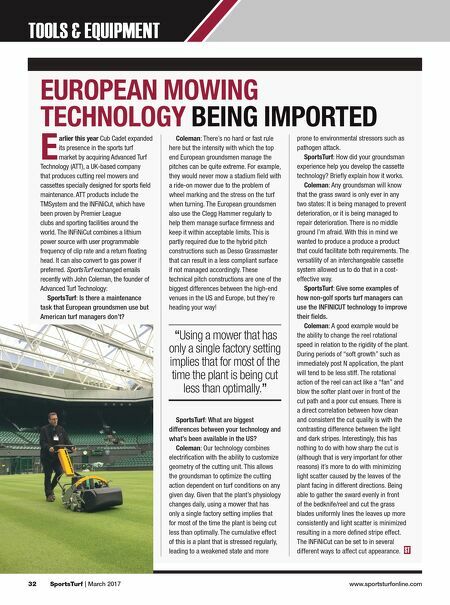 STMA IN ACTION News from the Sports Turf Managers Association 32 SportsTurf | March 2017 www.sportsturfonline.com TOOLS & EQUIPMENT EUROPEAN MOWING TECHNOLOGY BEING IMPORTED E arlier this year Cub Cadet expanded its presence in the sports turf market by acquiring Advanced Turf Technology (ATT), a UK-based company that produces cutting reel mowers and cassettes specially designed for sports field maintenance. ATT products include the TMSystem and the INFiNiCut, which have been proven by Premier League clubs and sporting facilities around the world. The INFiNiCut combines a lithium power source with user programmable frequency of clip rate and a return floating head. It can also convert to gas power if preferred. SportsTurf exchanged emails recently with John Coleman, the founder of Advanced Turf Technology: SportsTurf: Is there a maintenance task that European groundsmen use but American turf managers don't? Coleman: There's no hard or fast rule here but the intensity with which the top end European groundsmen manage the pitches can be quite extreme. For example, they would never mow a stadium field with a ride-on mower due to the problem of wheel marking and the stress on the turf when turning. The European groundsmen also use the Clegg Hammer regularly to help them manage surface firmness and keep it within acceptable limits. This is partly required due to the hybrid pitch constructions such as Desso Grassmaster that can result in a less compliant surface if not managed accordingly. These technical pitch constructions are one of the biggest differences between the high-end venues in the US and Europe, but they're heading your way! 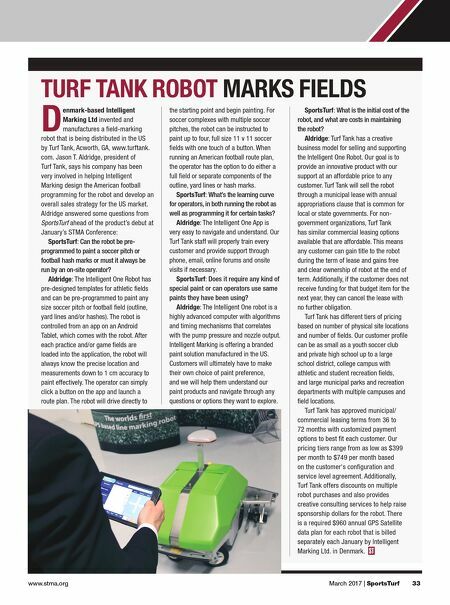 SportsTurf: What are biggest differences between your technology and what's been available in the US? Coleman: Our technology combines electrification with the ability to customize geometry of the cutting unit. This allows the groundsman to optimize the cutting action dependent on turf conditions on any given day. Given that the plant's physiology changes daily, using a mower that has only a single factory setting implies that for most of the time the plant is being cut less than optimally. The cumulative effect of this is a plant that is stressed regularly, leading to a weakened state and more prone to environmental stressors such as pathogen attack. SportsTurf: How did your groundsman experience help you develop the cassette technology? Briefly explain how it works. Coleman: Any groundsman will know that the grass sward is only ever in any two states: It is being managed to prevent deterioration, or it is being managed to repair deterioration. There is no middle ground I'm afraid. With this in mind we wanted to produce a produce a product that could facilitate both requirements. The versatility of an interchangeable cassette system allowed us to do that in a cost- effective way. SportsTurf: Give some examples of how non-golf sports turf managers can use the INFINICUT technology to improve their fields. Coleman: A good example would be the ability to change the reel rotational speed in relation to the rigidity of the plant. During periods of "soft growth" such as immediately post N application, the plant will tend to be less stiff. The rotational action of the reel can act like a "fan" and blow the softer plant over in front of the cut path and a poor cut ensues. There is a direct correlation between how clean and consistent the cut quality is with the contrasting difference between the light and dark stripes. Interestingly, this has nothing to do with how sharp the cut is (although that is very important for other reasons) it's more to do with minimizing light scatter caused by the leaves of the plant facing in different directions. Being able to gather the sward evenly in front of the bedknife/reel and cut the grass blades uniformly lines the leaves up more consistently and light scatter is minimized resulting in a more defined stripe effect. The INFiNiCut can be set to in several different ways to affect cut appearance. "Using a mower that has only a single factory setting implies that for most of the time the plant is being cut less than optimally."